You wouldn’t expect to see farmsteads and rural homes in a bustling metropolis like Bucharest –Romania’s capital. 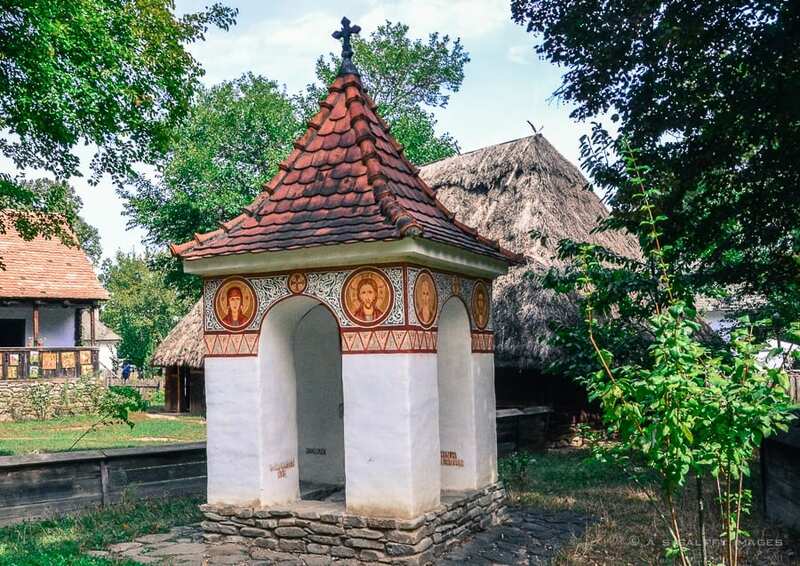 And yet, nestled in the northern part of city lies one of Europe’s oldest open-air ethnographic museums – the National Village Museum in Bucharest. 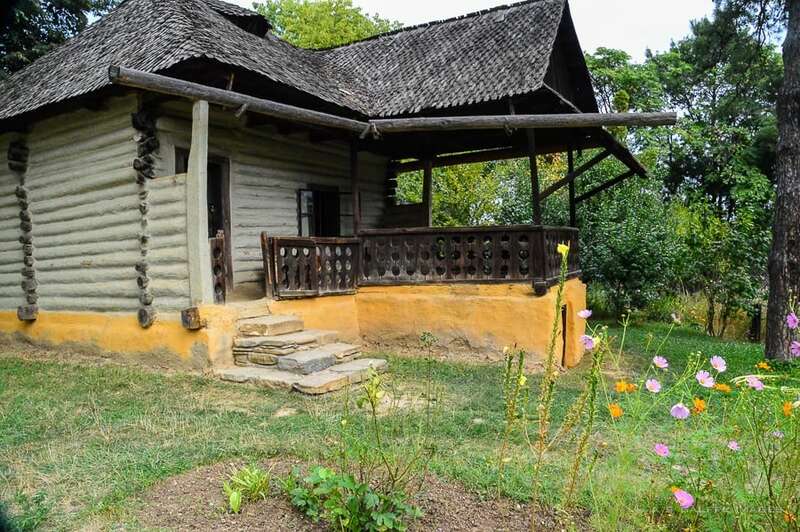 If you want to experience the folklore and traditional life of the Romanian countryside you should come here. The museum has one of the most interesting collections of rural homes, churches, farmsteads and watermills in the entire Europe. 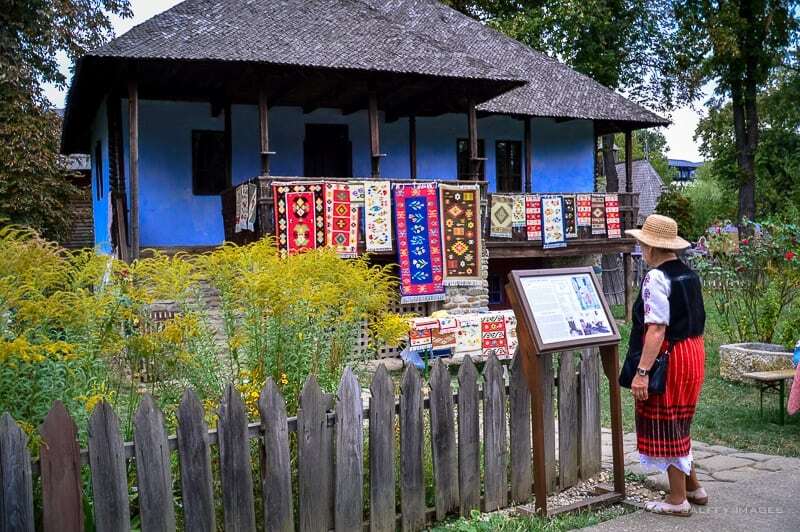 Walking through Bucharest Village Museum will make you feel like you are in the middle of a real countryside. The Village Museum in Bucharest (Muzeul Satului) was created in 1936 by the sociology Professor Dimitrie Gusti and funded by royal decree. Gusti went around the country and after many years of field research he came up with the idea of creating a Romanian village museum. Initially the museum started with only a handful of houses, windmills and watermills from various areas of Romania. The buildings have been disassembled and relocated here. During the second World War the museum faced very difficult times being used for war refugees. The houses and artifacts have fallen into total neglect. Under the Communist years that followed the museum continued to fall into disrepair. But despite of the harsh political and economic conditions, it managed to survive. In recent years, with grants received from the European Union, the collection has been restored and has grown into one of the most captivating outdoor ethnographic museums in the world. 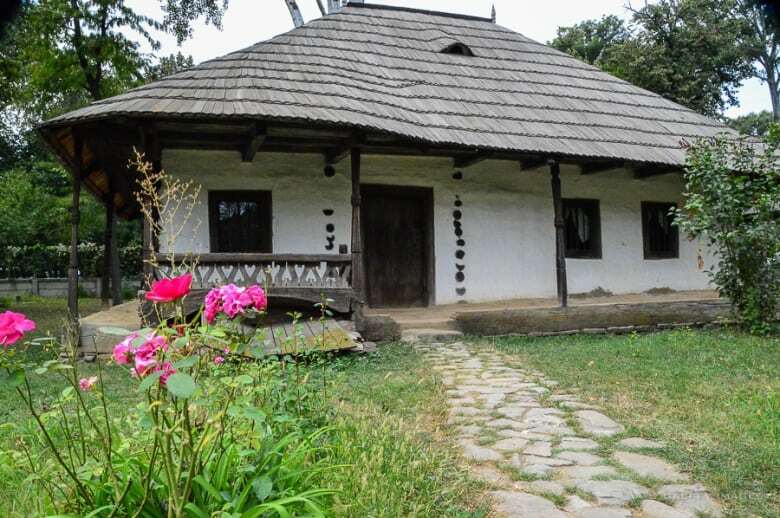 Today the Village Museum in Bucharest covers almost 25 acres of land. 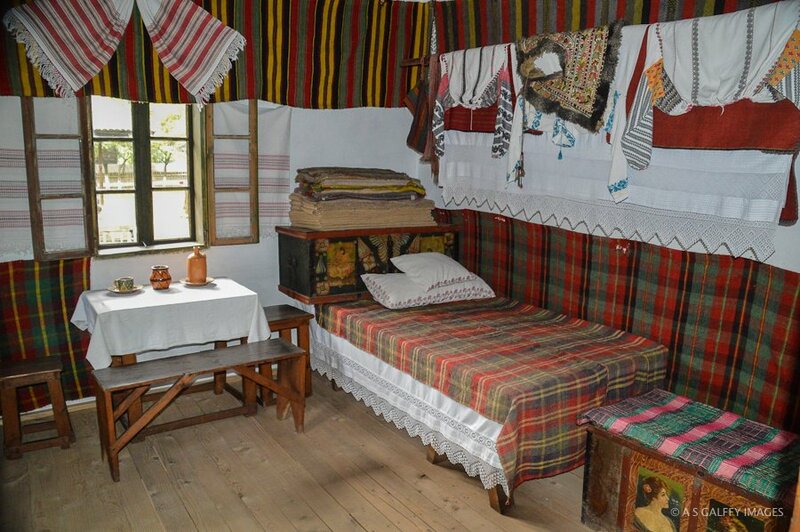 The museum features 272 authentic farms and peasants homes from the 15th to the 19th century gathered from villages in every region of Romania. Some of the houses display kitchen utensils, wool rugs, pottery and old farming tools. Most of these homes are simple wooden huts or basic shacks furnished with benches, stools and very primitive beds. The structures are made of traditional materials used by the peasants in the course of history (wood, clay, straw and sometimes stone). But the perishable nature of these materials poses a permanent challenge for the museum, as they are very difficult to preserve. 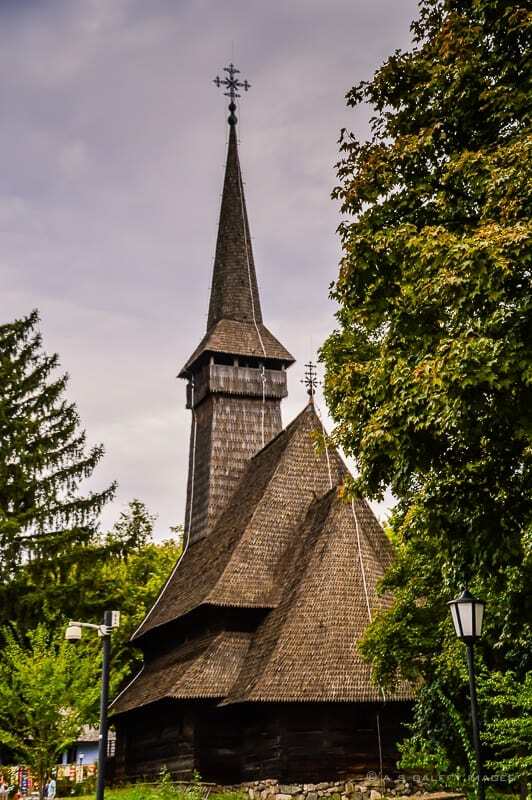 One of the highlights of the museum is the steep belfry of the wooden Maramureş church, complete with beautiful but faded icons. I found it very interesting that one of the houses was featuring gypsy metal crafts. 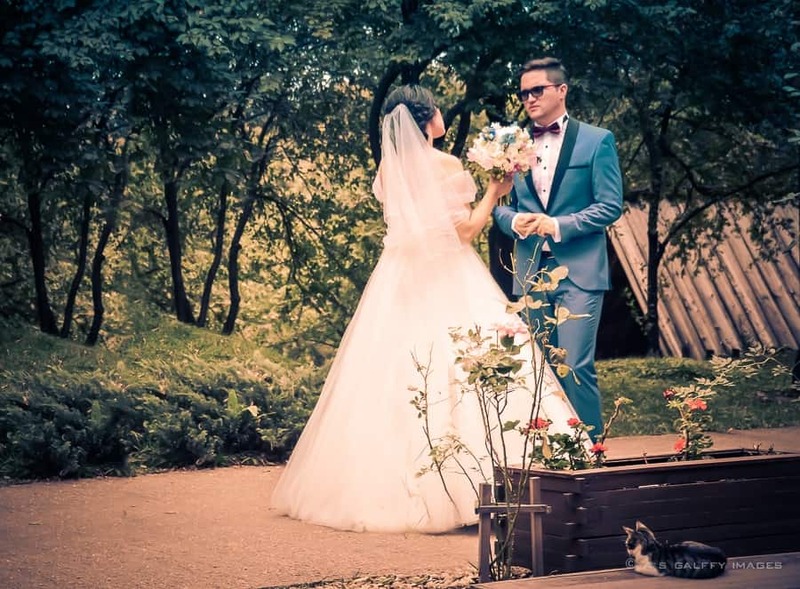 Like many of the countries in Eastern Europe, Romania is home to a large population of Gypsies whose traditional occupation is metalworking –tinsmiths and blacksmiths. Sadly, in Romania being a Gypsy is the worst social stigma. These dark-skinned people who ramble Romania’s countryside in caravans always lived by their own rules. They never managed to integrate themselves among the country’s white population, therefore remaining outcasts. Bucharest Village Museum has an ideal location: on the shore of the Herastrau Lake and just adjacent to the park bearing the same name. Strolling through the 25 acres of shaded lanes on the lake shore is just so beautiful! The museum is open year-round, but the best time to explore it is on a clear sunny day. We visited the museum on a week-end and it was relatively crowded compared to the week-days. But weekends have their own advantages. Being a Saturday, we had the chance to encounter several wedding parties who came to the museum for photo shoots. You can reach the Village Museum by bus or by metro, from the center of the city. If you come by metro, take line number 2 and get off at Aviatorilor. But if you don’t want to bother with finding your way around the city, you can take a cab. Taxis are very inexpensive in Bucharest. A complete tour of the Village Museum in Bucharest takes at least 3-4 hours. However, you can spend a lot more time on the grounds if you want to buy some souvenirs, have a picnic, or enjoy some of the local foods. The museum has a great souvenir shop and a stall selling traditional Romanian sweets and cakes. It even has a restaurant, La Francu, set in an original 19th-century inn. To visit the museum, you can choose to have a guided tour or a self-guided tour. Guided tours are available in English, French, Spanish, Italian, and Russian, but they require a reservation. If you choose to explore the Village Museum on your own you can rent an audio guides for 50 lei, or 8 lei on your smartphone. Walking the museum grounds is fairly easy, as there are signs both in English and Romanian. Admission fee is very reasonable: 10 Lei (about $3. Note: while the museum is open on Mondays, the houses are not. 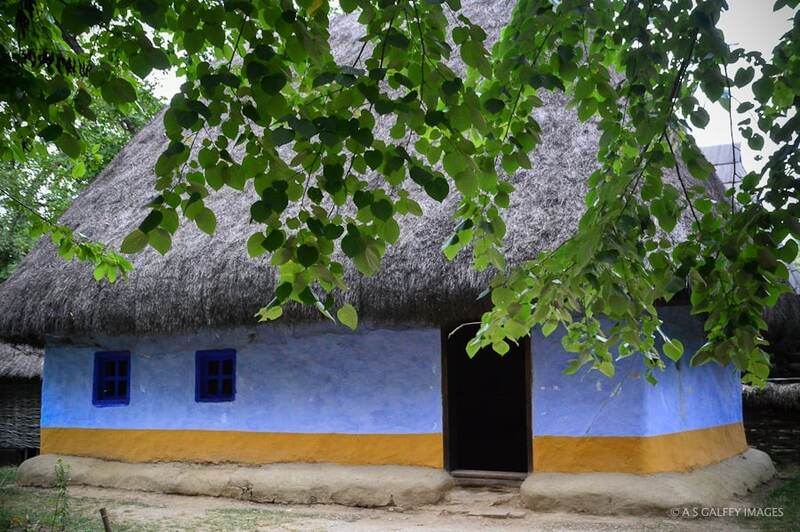 Bucharest Village Museum is not more interesting than Skansen, but it's equally worth visiting. What a fascinating museum to visit. I'm so glad they saved it. Until I read the caption about the gypsies, I had totally forgotten about how many come from Romania. I think the largest popular outside of Romania is in the panhandle of WV (my native state). We had thousands of them and they even made a TV show about the area at one point (which did not portray them in a good light at all). I've only been to Histeria and Constant, still so many great places to see in Romania. thanks for sharing. You mean Histria and Constanta? They are some of the oldest places in Romania. What a great spot to visit to learn more about Romanian history and culture. 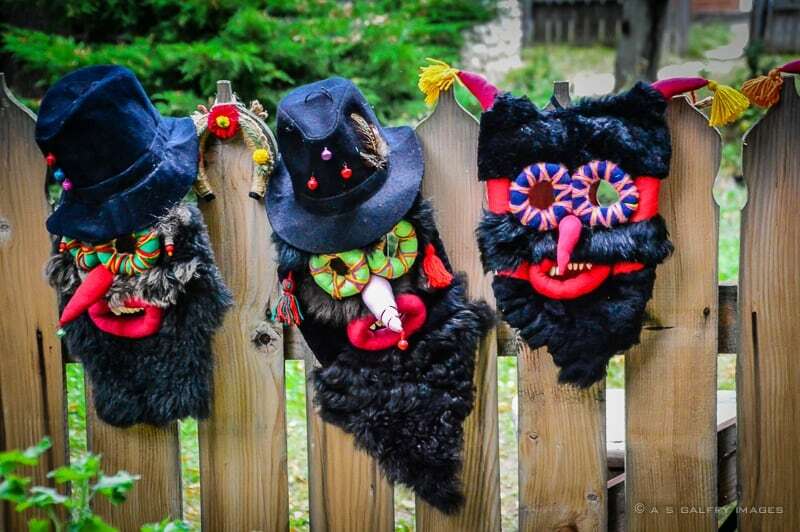 I love the wacky traditional masks as well and that freshly baked bread looks delicious. I haven't been to Bucharest yet, but it's on my list! I had no idea this existed in the middle of Bucharest. I went there a couple times for work and didn't realize. I love how they have options for both guided and self-guided tours and all the languages. Well, maybe next time you are in Bucharest you can visit the Village Museum. It's quite interesting actually. I been to Romania and Bucharest before but never heard about this museum. It looks so quaint and beautiful. I love exploring old buildings which also explains the local ways of life. 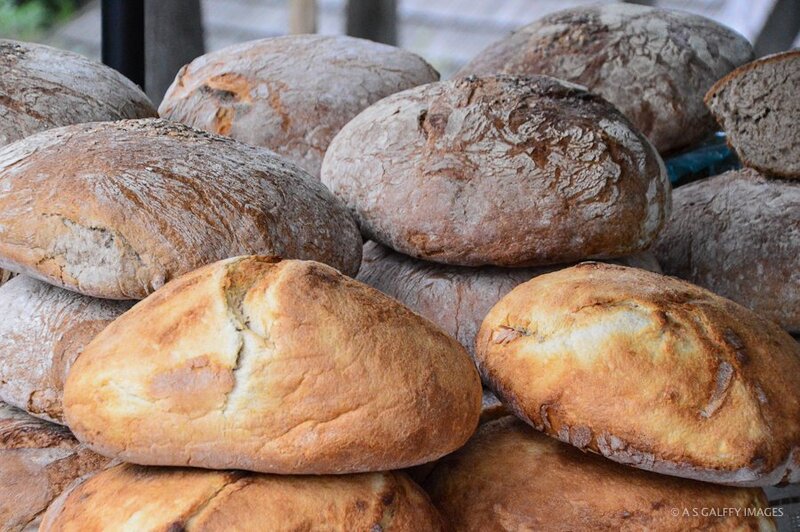 However, I have had fresh locally baked bread in the Romanian countryside and it just melts in your mouth. I love knowing more about vernacular architecture and the picture of the traditional peasants' house in your post made of wood, clay and straw fascinated me. Village museums help you learn so much! Just last week I booked a trip to Bucharest for this fall, so this post is very timely and helpful for me! The Village Museum and lakeshore sound like two great places to spend part of that trip, and I like that the museum offers an opportunity to learn about the authentic history of the area. 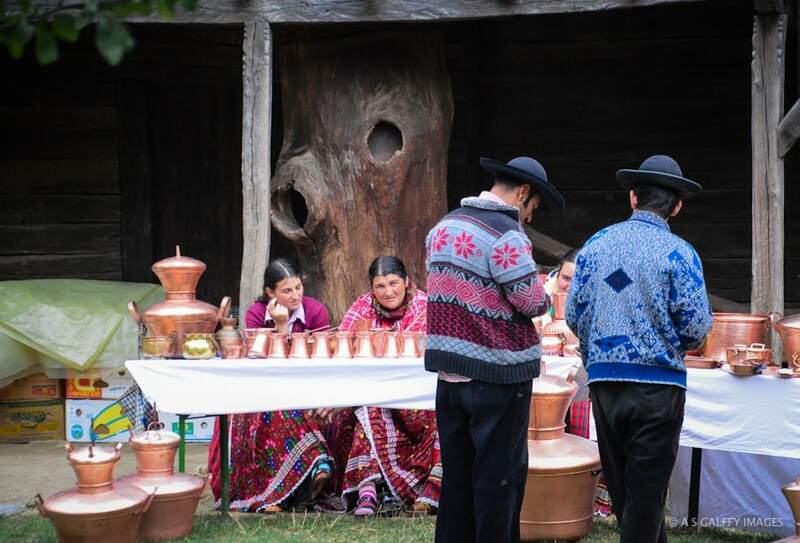 It's great that you can experience Romania's rural traditions without leaving Bucharest. I find the crafts and church architecture especially fascinating. I heard so much about this Village Museum in Bucharest, but I never visited it; Bucharest was so far from my home, with bad roads and long train rides, I've only been there once growing up. I visited a different Romanian Village Museum, with a school trip, but I can't remember where it was, and of course, it was falling apart, but still interesting. This one in Bucharest looks like a great destination, especially since it's taken care of. Beautiful photos, Anda. Makes me want to go visit next time I'm in the country. Bucharest has changed a lot from 30 years ago when I left it. It is now in a much better shape than it ever used to be, so it may be worth visiting if you go back to Romania. As for the roads, I agree they are very bad. Unfortunately that's a serious set back for visiting this beautiful country. Bucharest is high on my list to visit and I'd also put this visit on my list!! It's not too far from you, Esther. I would like to visit this museum. I like all the museums that show a typical way of life in a country or the countryside and this certainly seems to have lots of examples of it. Love the photo of the masks - how cool! Hope you'll make it to Bucharest sometime, Jill. It's a beautiful city. Romania is one of the less traveled eastern European countries that is really worth visiting, Brooke. I hope you'll give it a chance. It happens to be my birth country also.